Originally posted in the Philadelphia Magazine on March 15, 2013. 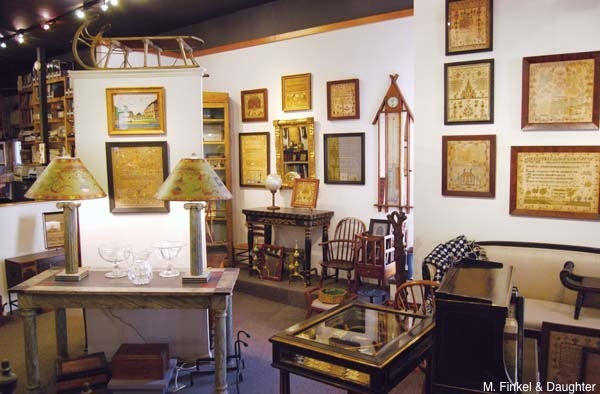 M. Finkel & Daughter (936 Pine St., 215-627-7797), housed in a circa-1840 building, was opened in 1947 by Morris Finkel as a period furniture shop featuring works from America, England and Europe. Daughter Amy joined in 1975, adding quilts from the late 19th and early 20th centuries and American needlework dating from 1770. Works can run from $2,000 to $100,000. (The other focus here: 19th-century American glass.) A recent find: a walnut partner’s desk, bought in New Hampshire, which was once used by a New England judge ($6,200). 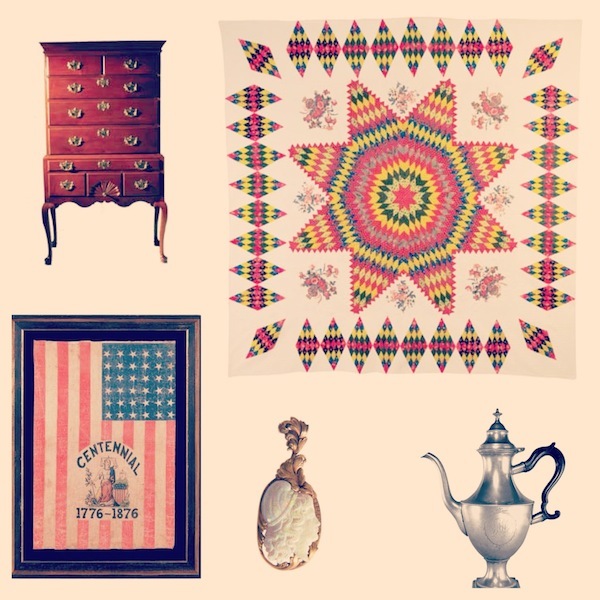 Anastacia Fahnestock and husband Scott Evans’ shop, Anastacia’s Antiques (617 Bainbridge St., 215-928-9111), is housed in a former carpet store from the 1800s located one block south of South Street and chock full of curiosities. Need a stuffed fox, turkey or badger, or maybe a bear rug? (Who doesn’t?) You’ve come to the right place. Papier-mâché masks or a velvet opera coat? They have it. Their furniture dates from the 1870s to 1920s, but they also carry everything from cufflinks to carnival banners. Their early medical holdings—microscopes, apothecary bottles, skeletons—are conversation pieces to enliven the ho-hummiest of nests. 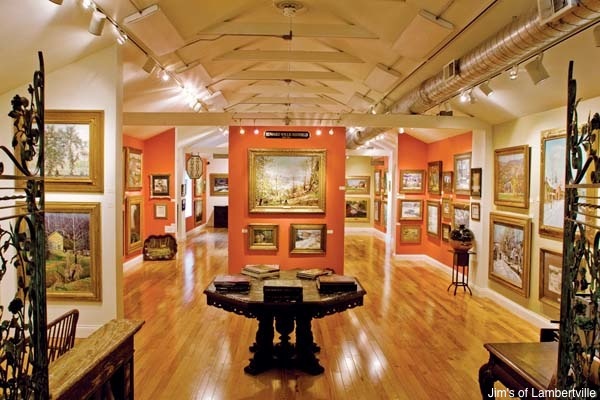 A trip to this bucolic river town should start with a morning at Rago Arts and Auction Center (333 N. Main St., 609-397-9374). Fans and collectors have made David Rago and his wife and business partner Suzanne Perrault’s the largest auction house in New Jersey, selling everything from Arts & Crafts furniture to contemporary art. Intimidated by the thought of raising a paddle? Partner Miriam Tucker advises attending an “unreserved auction,” where there is no reserve price. (They’ve unloaded pianos for pennies.) The average sale price at these events hovers between $300 and $500. (The next one is the weekend of April 19th to 21st.) Previews generally start the week before. “You can pick things up, ask questions, take photos, kick the tires,” says Tucker. Afterward, meander over to Broadmoor Antiques (6 N. Union St., 609-397-8802), where 10 different galleries and dealers sell everything from Pennsylvania Impressionists (Walter Baum and William Langson Lathrop among them) to 18th-century armoires and cabinets to Georgian flatware, tableware and boxes, all under one big roof. Recent finds include an 18th-century refractory dining table, ocelot pillows, and a 19th-century trophy table perfect for setting down your glass of brandy. A designer cult spot. If you’re looking to recreate Lord Grantham’s study in Downton Abbey, this is your place. Owner George Evans has renovated the late-1800s dry-goods store now known as Antiques on Union (32 N. Union St., 609-397-3300) to better display 10,000 square feet and three floors of antiques; he sojourns to estate sales in Palm Beach and beyond for clients and designers. Come here for furniture from 18th-century English Georgian to mid-century modern, Orientals and pricey porcelain. During a recent visit, I became obsessed with a circa-1950s, hand-cut Venini tubular glass chandelier sure to be the focal point of any room. Alas, not any of mine. Two final stops: First, Jim’s of Lambertville (6 Bridge St., 609-397-7700) sells not only beautiful antique furniture, but also lovely impressionist art. Michael Herold Design mixes old and new. Housed in the Laceworks Building (287 S. Main St., Suite 8, 609-460-4763), this is mid-century nirvana, with lots of Lucite, glass and swanky Rat Pack fare (bar carts! ), curated by a man anointed a “Next Wave” designer last year by no less an authority than House Beautiful. Recent pickups: Barbara Cosgrove metal quail lamps and Arne Norell safari chairs. 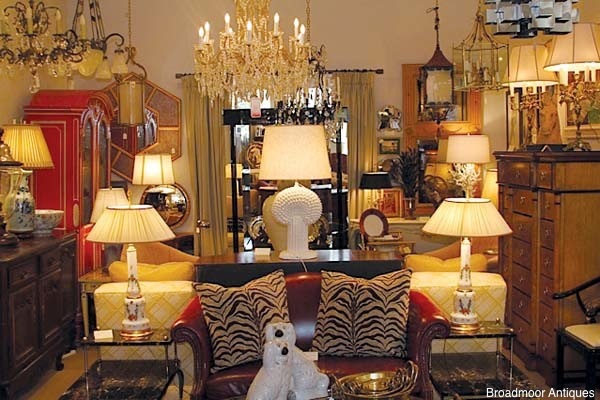 Once in Princeton, the first stop is Judy King Interiors and Antiques (44 Spring St., 609-279-0440). She’s decorated abodes in Princeton, Maine and Bedford, New York (read: monied places), but her quaint shop is more cozy than imposing. 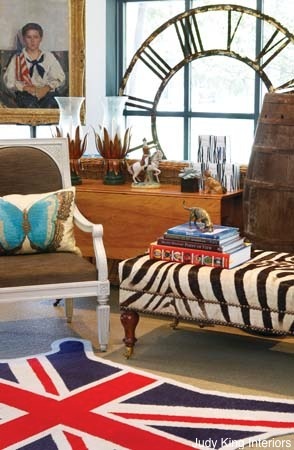 Her resource library: Stark carpets, Bunny Williams and George Smith furniture, and Phillip Jeffries wall coverings that she mixes with English and French art and antiques you can buy right off the floor. Also stocked: English antique case goods, piles of 1820s and ’30s Staffordshire figurines, mid-century chaises and chairs, and antique sconces and chandeliers. For nine years, Lei Xu has been selling antiques and art from all over Asia at Dynasty Arts (20 Nassau St., 609-688-9388), including early 20th-century scroll paintings and Japanese woodblock prints, as well as 100 year-old decorative wood carvings. Her glazed porcelain offerings span from ultra-rare Han dynasty pieces to 200-year-old ginger jars. Your last stop is Leo Arons at The Gilded Lion (4 Chambers St., 609-924-6350). The professorial type, Arons favors both the unusual (a Himalayan jeweled headdress!) and the rare (a dressing table from Alexander Hamilton’s family; leaves from medieval manuscripts). Affordable collectibles include ceramic cosmetic boxes from a 500-year-old shipwreck ($100). The furniture can be a tad pricey, but really: Who can put a price on style?